The EC Pierce, Jr., MD, Patient Safety Memorial Lecture honors the founding president of the APSF, Dr. Ellison C. Pierce, Jr., for his countless contributions to anesthesia patient safety and his timeless vision that “no patient shall be harmed by anesthesia.”1 It is appropriate that this year’s honoree, Dr. Robert Caplan, emeritus anesthesiologist at Virginia Mason Medical Center, pioneer in patient safety and former APSF board member was selected to discuss the evolution of how we recognize, manage, and prevent medical errors to reduce harm to, patients. With the mentorship of “Jeep” Pierce, Dr. Caplan has spent much of his career devoting time to moving the needle closer to zero patient harm. First, Dr. Caplan reflected on the importance of Dr. Pierce’s words, “If you hide mistakes, you can’t learn from them.”1 He reported his own firsthand struggles with rising medical errors and a stagnant hospital culture that was not conducive to positive change for patient safety. Dr. Caplan explored the dilemma of Dr. Pierce’s vision of “zero patient harm”—immensely difficult to rationalize and achieve, but the only desirable endpoint for patient, provider, and health care. Dr. Caplan focused the audience’s attention on a sentinel event in his own institution where a patient accidentally received intravascular chlorhexidine instead of intravenous contrast. This resulted in the patient’s unexpected death from major internal organ injury. 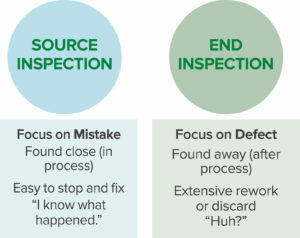 As a safety leader, Dr. Caplan and his colleagues looked to the Toyota production line model as a way to systematically reduce medical errors.2 Every employee was trained to be a safety inspector, using the technique of source inspection. This technique focuses on finding and fixing mistakes at a time and place where they can be reversed and remedied, thereby delivering a defect-free product to the patient. Dr. Caplan contrasted source inspection from end inspection (Figure 1). 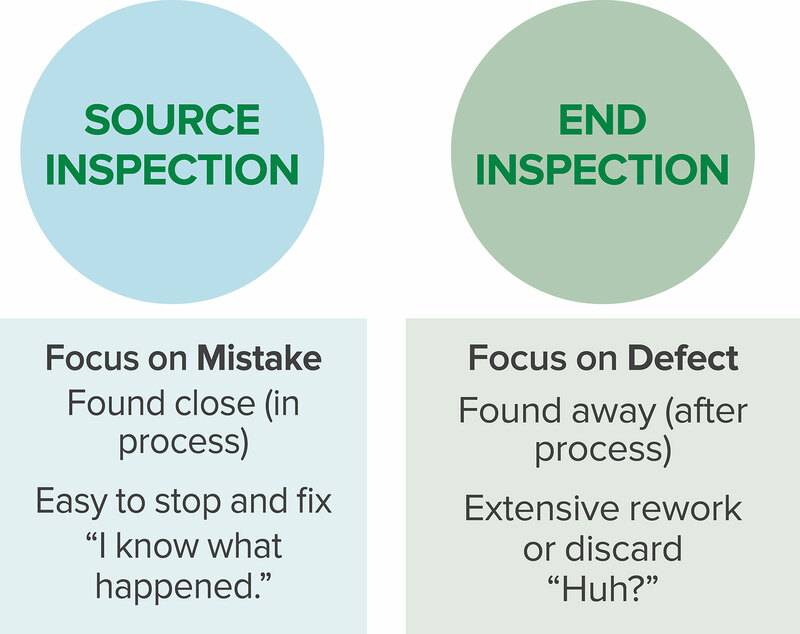 End inspection (an audit is the classic example) focuses on the detection of defects that are fixed in the health care product and are difficult to remedy or remove (Figure 2). Figure 2. Examples of a Mistake (where a placed intravenous line is infiltrated) vs. a Defect (where the unrecognized infiltrated intravenous line resulted in tissue necrosis of the arm). Significant roadblocks occurred for Dr. Caplan and his colleagues when implementing safety initiatives. They turned to Dr. Lucian Leape, an internationally renowned leader in patient safety. Dr. Leape helped them understand that widespread provider disrespect is perhaps the most important obstacle to the pursuit of patient safety.3 In the health care setting, disrespectful behavior typically occurs in six identifiable ways (Table 1). With Dr. Leape’s guidance, Dr. Caplan and his colleagues systematically elevated awareness of disrespectful behavior and promoted respectful alternatives. An especially important lesson was that disrespectful behavior is not just a problem created by individuals— it is also a problem created by the system. When the system is indifferent to weak and wasteful safety measures (chats, posters, announcements, on-line tests, policies that are hard to find or read), providers become discouraged and disengaged from safety work (Table 2). Dr. Caplan invited all members of the anesthesia community to reflect on the pervasiveness of weak and wasteful safety measures, and to consider the possibility that machine learning or artificial intelligence could help us discover more effective ways to find mistakes and deliver defect-free products. In conclusion, Dr. Caplan challenged health care professionals to go for “zero.” Why not identify a specific adverse outcome and eliminate it? This is just what the World Health Organization did with smallpox. Dr. Caplan suggested that there was no reason to delay—our specialty has the talent and leadership in anesthesiology to do it. Dr. Greenberg is presently editor-in-chief of the APSF Newsletter and vice chairperson of Education in the Department of Anesthesiology, Critical Care and Pain Medicine at NorthShore University HealthSystem in Evanston, IL. He is clinical professor in the Department of Anesthesia/Critical Care at the University of Chicago. Dr. Greenberg has no conflicts of interest pertaining to this article. Pierce, EC. The 34th Rovenstine Lecture: 40 years behind the mask: safety revisited. Anesthesiology. 1996;84:965–975. Liker, Jeffery (2003), The Toyota Way: 14 management principles from the world’s greatest manufacturer, First Edition, McGraw-Hill. Leape LL, Shore, MF, Dienstag JL, et al. Perspective: a culture of respect—part 1 and part 2. Acad Med. 2012;87:845–858.